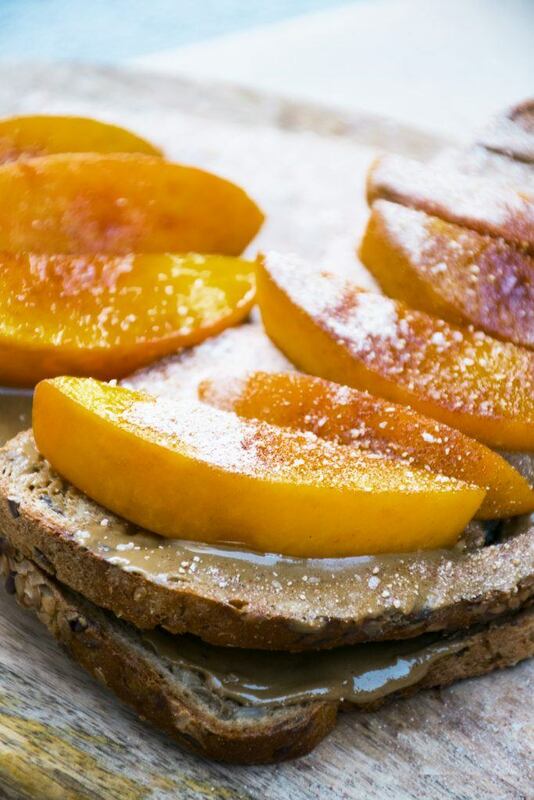 Whether you are dunking it in your Golden Pumpkin Chai, smashing it together for a gooy pre trail run snack, or simply swapping out the toast and topping it on your favorite ice cream to end a long work day, you will want to snag the last bit of peaches before they go out of season to try this Sautéed Coconut Peach Toast. In the wellness industry both CBD oil and coconut oil have their own spotlight, providing incredible health benefits in their own diverse ways! In the recipe below, we combine the two to provide an even more powerful health punch. Before we look at why these two oils make such a great match. Let’s first look at some of the benefits of each individual oil. To learn more, we recommend checking out our FAQ page and the Project CBD. In this recipe, we combined coconut oil along with the Raw Full Spectrum CBD Oil. 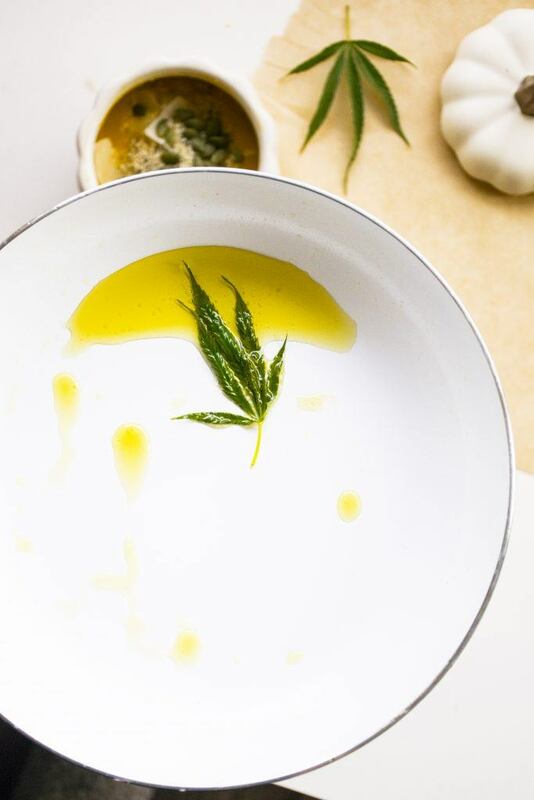 Since cannabinoids are fat soluble, meaning that the body absorbs it better when taken with oil or fat than with water, it is suggested when cooking with a CBD oil it is best to pair it with a health fat. 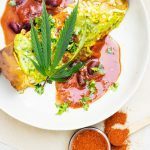 Finding a healthy fat to cook with will boost the absorption of CBD, and ensure you get the most out of your CBD. The fats in coconut oil are known as medium chain triglycerides (MCTs) which are shorter chain fats. MCTs are more rapidly digested and are superior for nutrient absorption. CURED utilizes both, MTC and grape seed oil, in the tincture products. So when pairing it with your favorite recipe, the cannabinoids are already ready for full absorption. 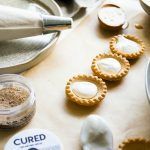 To experience the highest magnitude of the proposed benefits of the CBD oil, we combined it with two of our favorite fats for this recipe: coconut oil AND almond butter. Let’s get nutty about this recipe now. Add the coconut oil to a sauté pan over medium/low heat. Once melted, add in the sliced peaches, Raw Full Spectrum CBD Oil, and sauté until softened, about 5 minutes. Sprinkle on Cinnamon and Honey Spice and stir to combine. Remove form the heat and set aside. Spread the almond butter generously over the two slices of toast. 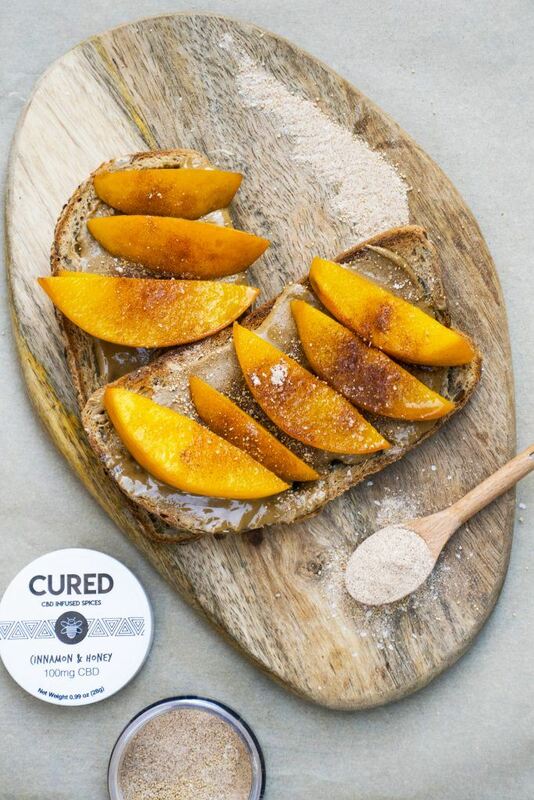 Divide the sautéed cinnamon peaches evenly over the almond butter toast and garnish with the toasted coconut and slivered almonds if desired. Yum, yum, yum! I bet all the flavors meld together so perfectly! I can’t wait to try it!